Sharon Evans is the Membership Director of the the Reel Cowboys. She is also one half of the musical comedy team of "Evans and Rogers." With a background of classical training and strong jazz influences, Sharon has a voice and delivery that turns heads and makes people stop to listen. As a jazz vocalist, Sharon has worked in the Los Angeles nightclub scene, primarily alongside veteran jazz musician Dan Weinstein--first with his Groove Merchants of Venice ensemble and then with his swing band Daniel Bone and the Two-Tones. As guest vocalist she has performed with Grammy Award winner Billy Mitchell, Howlett Smith, Phil Crosby, Jr., and many others. She has given performances at venues such as the Ten-20 Club, Spazio, Miceli’s, the Pig ‘n Whistle, Jax, Joe’s Great American Bar and Grill, Steamers, and The Hop. 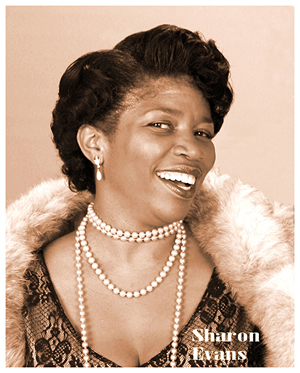 As for festivals, Sharon has given solo performances at the Fullerton RagFest, the Tarzana Tunefest, and the Culver City Car Show, as well as on local television and radio programs. Among the awards she has received is the Jeanne SCMPC Angel Award by the Southern California Motion Picture Council. In 2006, Sharon teamed up with Rick Rogers and together they write and produce their own variety shows, perform at festivals, local venues and special events. As Evans and Rogers they were called "Vaudeville sensations" in the November 2009 issue of Vanity Fair Magazine after their appearance at Maxwell DeMille's Cicada Club. In 2011 Sharon & Rick became husband and wife. Both are recipients of the President's Award from the Southern California Motion Picture Council.